Today (28th July 2014) the Department for Energy and Climate Change has launched the 14th onshore licensing round for unconventional oil and gas with the headlines saying that fracking will not be allowed in national parks or Areas of Outstanding Natural Beauty other than in exceptional circumstances – to be decided by the Minister for Communities. 14th Licensing Round, England, Scotland, Wales. 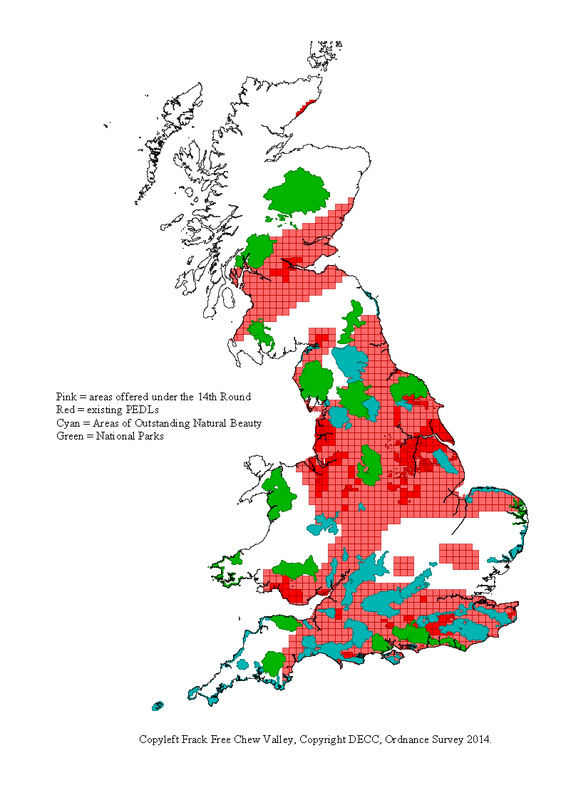 Green = national parks, Cyan = AONB, Red = current licenses, Pink = new areas being offered for licence. Copyright 2014, DECC, Ordnance Survey. 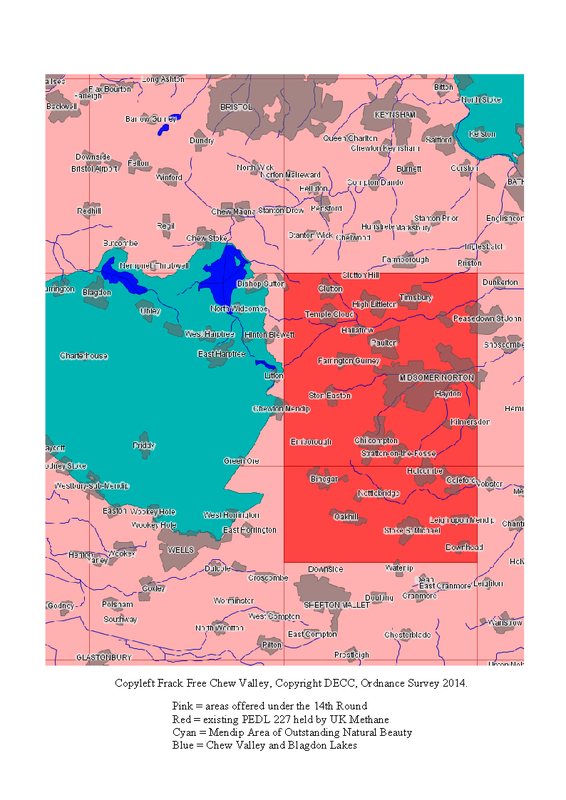 What does this mean for the Chew Valley and surrounding area? PEDL 227 around Ston Easton remains. This area is neither within the AONB or water source protection zones. UK Methane’s licence contains a firm commitment to “obtain 19km of 2D seismic data on Block ST65” (the upper portion), “obtain 1.5km of 2D seismic data on Block ST64”, “drill one well to a depth of 800m”. Parts of the Chew Valley are neither within the AONB or the water source protection zones which only cover ground water aquifers. Having been both evaluated and relinquished at least twice these areas are again been offered to gas companies for exploration in the full knowledge of previous evaluations. Rather than “one of the cleanest fossil fuels” the Minister presumably means “one of the least dirty”. His view of unconventional gas as a bridging fuel is not shared by DECC’s outgoing Chief Scientific Advisor, Professor David MacKay of Cambridge University, who recently advised DECC that in the absence of a globally binding agreement to control carbon dioxide emissions that any new fossil fuel would lead to increased cumulative greenhouse gas emissions leading to further global warming. Ministers have collective amnesia when it comes to this inconvenient truth. You have an opportunity to contribute your views on what happens in your local area in terms of location, size, pace and design of developments. There are open events during July and August – see http://www.cvnp.co.uk. These events give people who live and work in the area the chance to comment on what they would like to see included in the Chew Valley Neighbourhood Plan. This post updates Why Wytch Farm is a poor fracking comparison for Somerset with the new information we have from the Department of Energy and Climate Change (DECC) on the reality of coalbed methane (CBM) production in Chew Valley and the surrounding areas of Somerset and why the two don’t bear comparison. 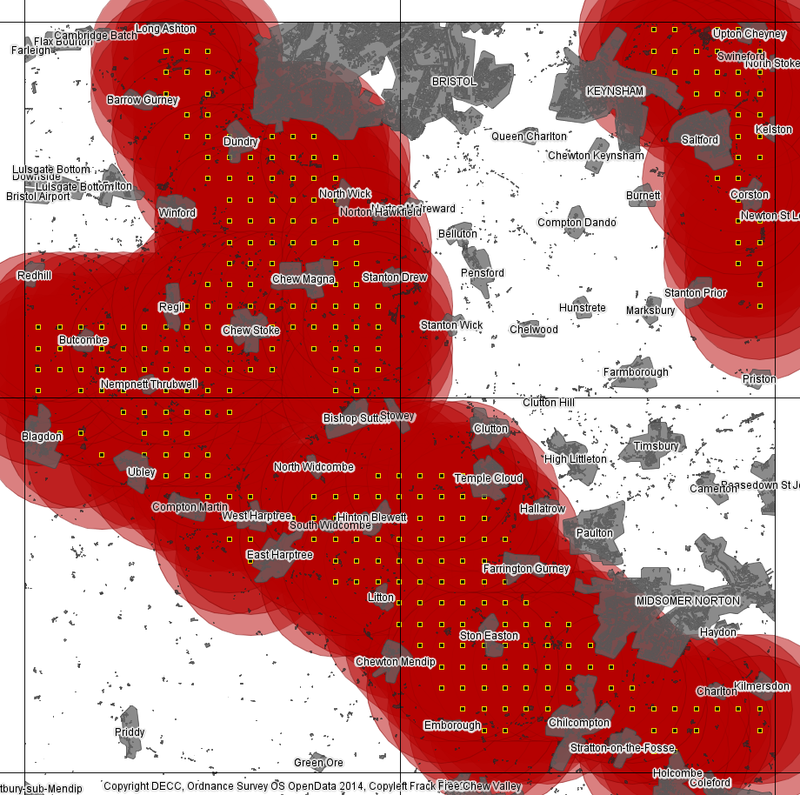 The information presented below is all based on data from DECC, the British Geological Survey and the Ordnance Survey. 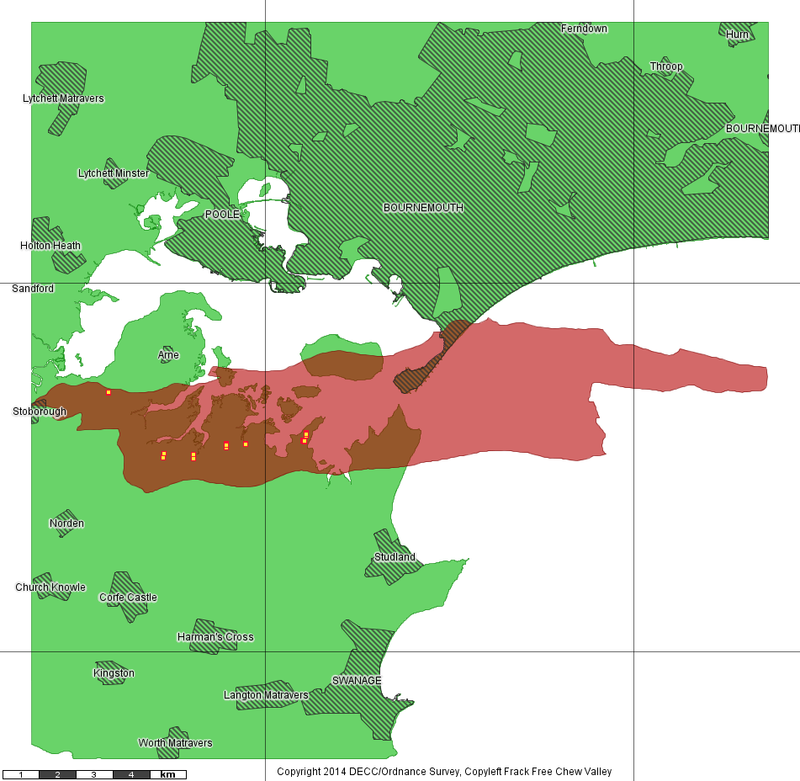 Wytch Farm is an oil and gas field on the south coast of England, it is described as “the largest onshore oil field in western Europe” despite the fact that most of it is offshore. What is the significance of Wytch Farm? In relation to unconventional gas in Somerset Wytch Farm is significant because some people say the development at Wytch Farm shows that similar development in Somerset needn’t be obtrusive – read on. 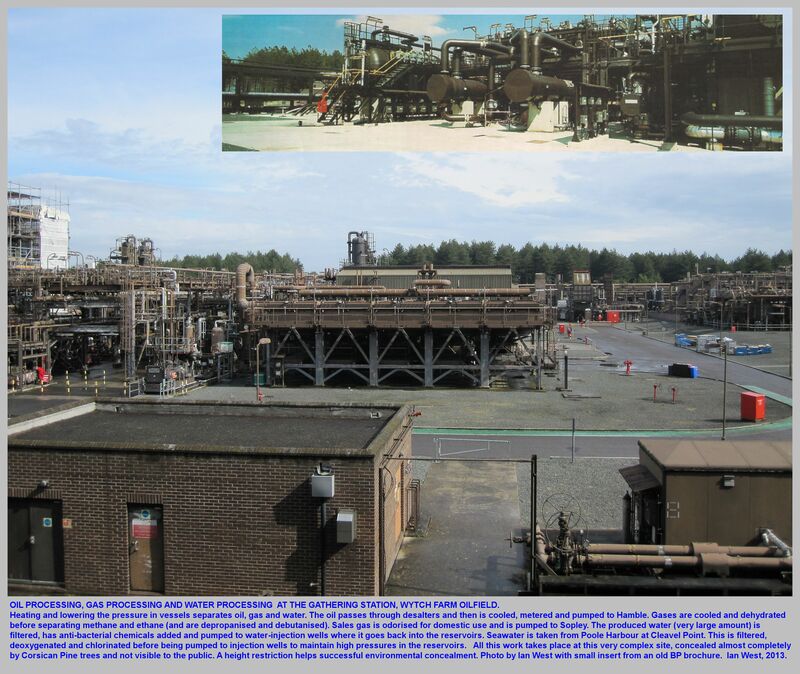 The onshore processing facilities and oil and gas wells are located on the shoreline of Poole Harbour between Corfe Castle and Bournemouth. The oil field (shown in pink in the figure below) occupies 47.6 sq km in total, of which 16.9 sq km (35%) are onshore and the rest offshore (64%). Wytch Farm Oil Field shown in pink. Wells in yellow. Onshore or offshore? How many Wells are at Wytch Farm? There are 200 wells at Wytch Farm all of which are classified by DECC as conventional oil and gas wells, NOT shale gas or coalbed methane. Of these 55 of the wells (28%) are either in the English Channel, in Poole Harbour or on Furzey Island, which leaves 145 onshore wells (72%). Some of these wells have used directional drilling to extend up to 11 km under the English Channel. How deep are the wells at Wytch Farm? The wells at Wytch Farm are approximately 1,600m (5,250 feet) beneath the surface. By comparison the DECC/GeoMet report on potential CBM wells in Somerset is based on wells from 152 m (500 feet) to 1,524 m (5,000 feet) depth, so potentially ten times shallower than at Wytch Farm. What do the Wytch Farm facilities look like? It is not visible to the public because almost nobody lives within miles of it, read on. What impacts have the Wytch Farm developments had on local communities and how similar might this be to the Somerset case? There is no direct answer to this post development but it is reasonable to assume that proximity of communities to the wells in an important factor in terms of traffic, air, noise and light pollution. It is worth also noting that any surface spillage at Wytch Farm would drain into Poole Harbour whereas surface spillage in Somerset may drain into Bristol’s potable water supply. As an indicator of local impacts how many buildings occur within a 2 km radius of the wells and Wytch Farm compared with the potential CBM wells in Somerset – according to the DECC/GeoMet assessment? Note that Dallas City Council has banned fracking within 1,500 feet (460m) of any residence, school, place of worship or protected area. Using Ordnance Survey OpenData of buildings there is a total of 6 hectares of buildings within 2 km of the onshore wells at Wytch Farm. This includes residential, farm and industrial buildings including the oil processing facilities themselves. 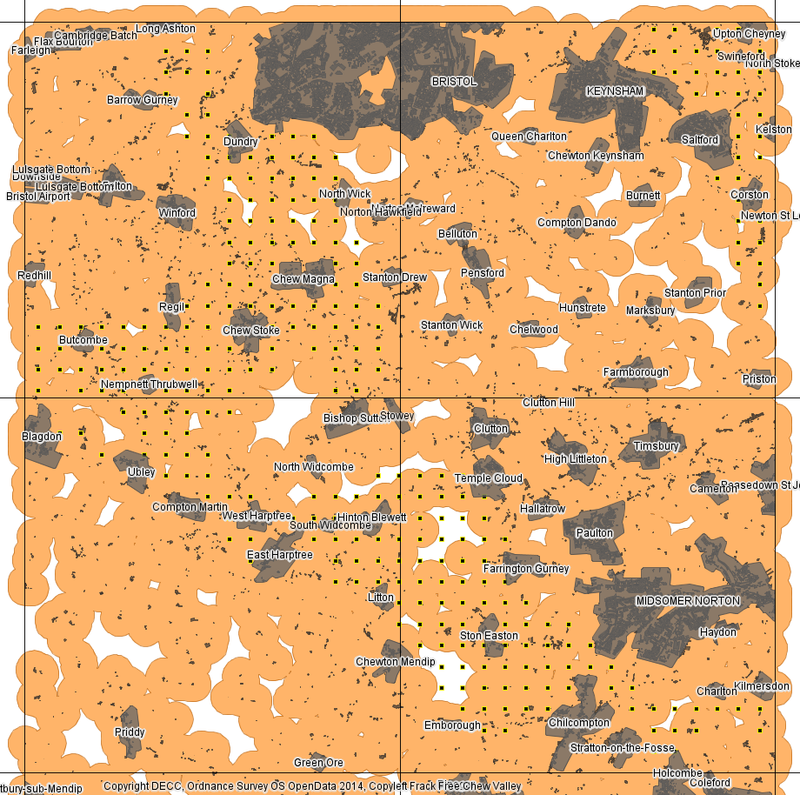 Performing the same exercise around the 300 hypothetical wells in Somerset as specified by DECC/GeoMet gives the following pattern in which there are 876 hectares of buildings within 2km of a well. So in Somerset there are 140 times more buildings within 2 km of a prospective gas well than at Wytch Farm. Another way to look at this is to look at the distance of all building from a well. 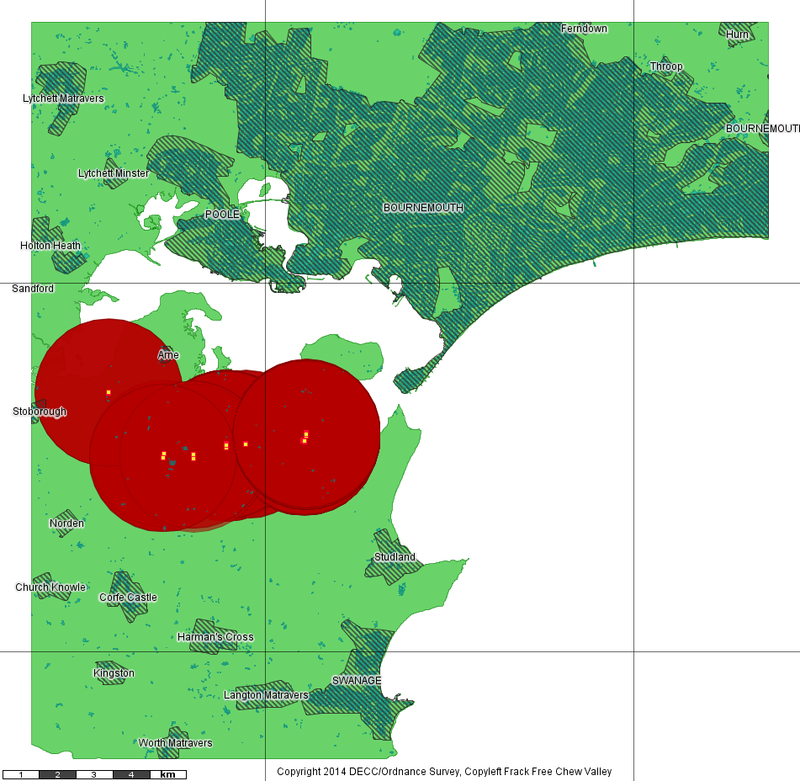 So this graphic of cumulative area of buildings (Y) against distance to a well (X) for Wytch Farm shows that the proportion of buildings within 2 km of a well is almost zero. Conversely this graphic of cumulative area of buildings (Y) against distance to a well (X) for Somerset shows that about half of all buildings would be within 2 km of a CBM gas well. For Wytch Farm about half of all buildings would be within 9 km of a well, in Somerset all buildings would be within less than 6 km of a well. 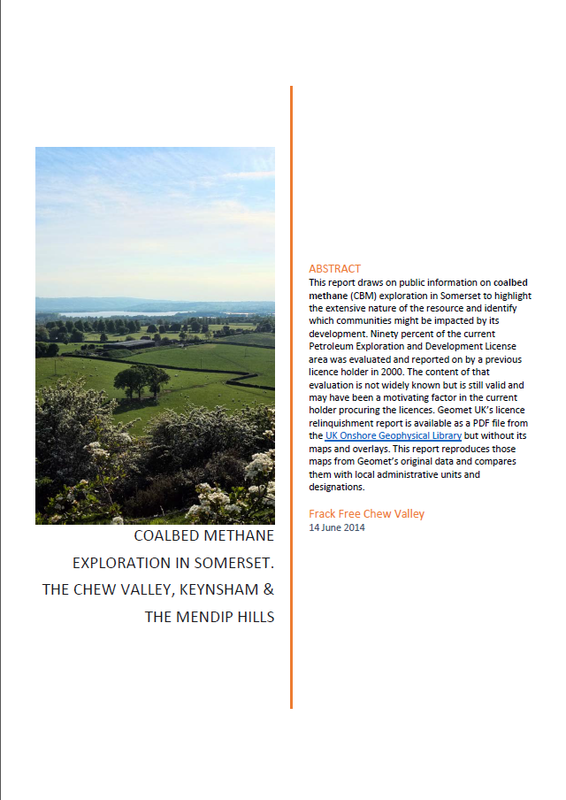 Based on information from the Department of Energy and Climate Change, the British Geological Survey and the Ordnance Survey it is pretty clear that conventional oil and gas production at Wytch Farm has little in common with coalbed methane development in Somerset either technically or spatially. The “put a hedge around it” argument is just not good enough. Is 2 km too big? Let’s try a 460m zone around building like the Dallas City Council ban, what does that look like? The Dallas ban applied in the Somerset CBM field would effectively squeeze out CBM development. Somerset’s rural areas are highly populated when compared to either America or Wytch Farm.